In 2010, housing was the biggest expenditure in Canadian’s budgets, at 21.3%. Lone-parent families spend proportionately more on shelter than do couple families with children. They also spend proportionately more on food, education, and health care. 1 “Campaign 2000, 2011 Report Card on Child and Family Poverty in Canada.” http://www.campaign2000.ca/reportCards/national/2011EnglishRreportCard.pdf – accessed on June 29, 2012. 2 Statistics Canada. 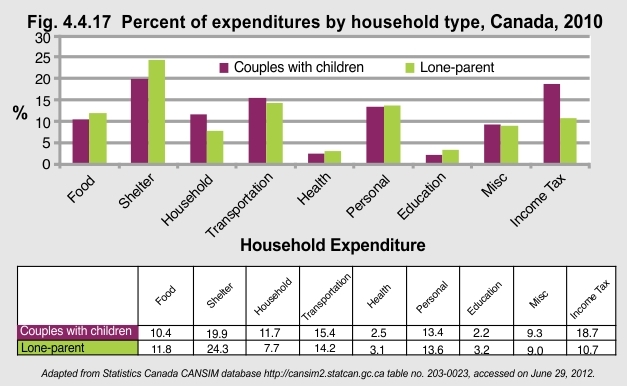 “Survey of Household Spending, 2010.” http://www.statcan.gc.ca/daily-quotidien/120425/t120425a001-eng.htm – accessed on June 29, 2012. 3 Jackson A, Roberts P. (2001). “Physical Housing Conditions and the Well-Being of Children.” Background paper on housing for The Progress of Canada’s Children 2001. Ottawa, ON: Canadian Council on Social Development. http://www.peelearlyyears.com/pdf/Physical%20Housing%20Conditions%20and%20the%20Wellbeing%20of%20Children,%20Canada.pdf– accessed on June 29, 2012.